What? How do these two things go together you might ask. I was watching this movie, Fanboys, which is an homage to Star Wars Fans everywhere. And well I am a Star Wars fan and I have found Star Wars themed Tarot decks. YES! Of course they are just art projects because none are sanctioned by Lucas but they are amazing. And really why not share two of my favorite things with you? A young woman of strong intellect and intuition, Amidala augments her power and security through her ever-changing appearance. Elaborate clothing and makeup obscure her youth and unimposing size–the same traits that allow her go mostly unnoticed in her guise as the handmaiden Padmé. She is herself deceived in Senator Palpatine, her people’s representative to the Republic, who seeks to use her to further his own political interests. She forms an instant bond of friendship with young Anakin Skywalker, unaware that he will grow up to love and later betray her. Meanings:Deception. Twilight. Obscurity. Intuition. Disillusionment. Danger. Caution. Bad influence. Ulterior Motives. False friends. Slander. Libel. Unknown enemies. An insincere relationship. There are deeper reasons for what happens. Strange connections between people, beyond their own understanding. Though friendly and cheerful, Jar Jar Binks often finds himself in others’ bad graces due to his tendency to act without thinking. Even Qui-Gon Jinn loses patience with this walking embodiment of his own admonition to “use your instincts”. 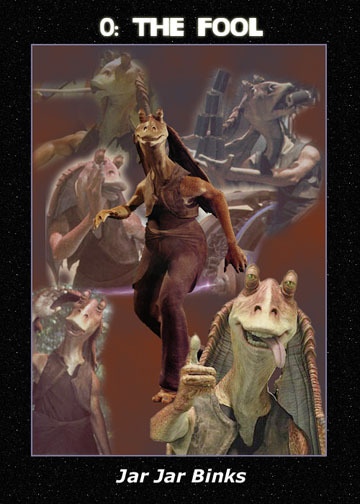 Hopelessly accident-prone, Jar Jar nonetheless seems to lead a charmed life, avoiding serious injury and sometimes even helping himself and others by sheer chance–or perhaps the workings of the Force. He has a childlike view of the universe and of how people should treat one another, and is frequently bewildered by the aggressive behavior and intrigues of those around him. Meanings: Thoughtlessness. Folly. Immaturity. Irrationality. Insecurity. Delirium. Enthusiasm. Naivete. New Hope” Luke Skywalker as The Fool. He is starting of on his journey, uncertain of the path ahead. “With the blast shield on I can’t see anything!” He doesn’t know where the path will lead him. Off the cliff? R2-D2 is his loyal sidekick. This is the 4 of Swords- Han Solo in carbonite! Han solo in Carbonite. He’s resting, contemplating, hibernating. “This was a card that started off as very plain. I realized that it would pack a punch after the color was applied- and it did. However, during the course of it, there was an off-again, on-again love-hate relationship with the card. And I just kept reminding myself to hang in there- the color would vastly improve it. Also, during my time working on the card, Jason Derulo’s “Riding Solo” came on the radio at least half a dozen times. This only made me laugh every time it did- because the first few times I heard that song I couldn’t help but think about Han Solo when he hit the chorus. So eventually when the song came on, I would hold up my card and point when he said “Solo”. A special shout out to “shadechristiwolven” for helping me decide upon the final suite of the deck! The suit of Pentacles is hereby known as “Planets”. As the most Grounded of the suites, Han fits both the Material aspects, as well as the business-like quality of the suite. While I never understood all the other girls fascination with the “bad boy heart throb”, and that whole “I love you-I know” bit made me want to slap him across the face- there is no doubt that deep down, Han is a good guy. Deep deep Down. Deep deep deep DEEP down. Anyhow, originally he was also going to hold his blaster.. but it seemed so “eh” out of place in the card. I like it the way it is. The gold “planet” Han hold is also iridescent… and I’m STILL wishing I had a better scanner for these. Killin’ me here. Also, in another amazing turn of events, this card has an odor to it. I don’t know how, I don’t know why… but using my Golden Ochre Pencil on the board made it begin to smell like… well, something probably you would smell around a Scruffy Nerfherder like Solo. “Like “The Hermit” card, some of the titles themselves are obvious give-aways to the content. However, it is to note something interesting: I cannot “read” Tarot cards. I have my own deck of cards I “read” from but they are not Tarot. This series is a result of a sort of “epiphany” I had one night… and I decided to run with the idea. After all, Star Wars is full of Archetypes that are found within the Tarot Cards as well, so I decided I would just illustrate what I “felt” fit the image/meaning of the card, and look for the “official” meaning/content after I was done. This way, I wouldn’t be swayed by the pre-conceived notion, but run with my instincts. As an artist (and generally as a person) I run by instinct over knowledge most of the time. My gut is my best intuition so I never ignore it. These are just a few of the amazing things you can find if you put in Star Wars + Tarot in goggle or if you watch i09. It shared some of the amazing Scifi and Tarot. To read more check it out here. And if you want an Analysis of Tarot Archetypes in the Star Wars Series this is a great from The Magician’s Hidden Library. I am posting into the wee hours of the evening and listening to the 80’s music channel on Comcast. All of a sudden Christopher Cross’s “Arthur’s Theme” cames on and and I am back in High School choir getting ready to sing with the Altos Section for our Spring Performance and my friend Scott is playing keyboard. Funny what songs remind you of some times. And yes I still know all the words. Is this good? Who knows. Did I smile at the memory? Yes I did. And now it is followed by Bryan Adam’s “Summer of ’69” which was one of those rebellion songs for me. Silly Rose. I found hard rock in college, but that is an other memory and another post. I am working to expand my Tarot journey to offer readings to others here by doing phone readings. I have been trying to find the best way to do this by creating a reading page and opened up a paypal account to help make this easier to do. I am available to do readings in the evenings on Mondays, Wednesdays and Thursdays from 7:30- 9:45 pm. 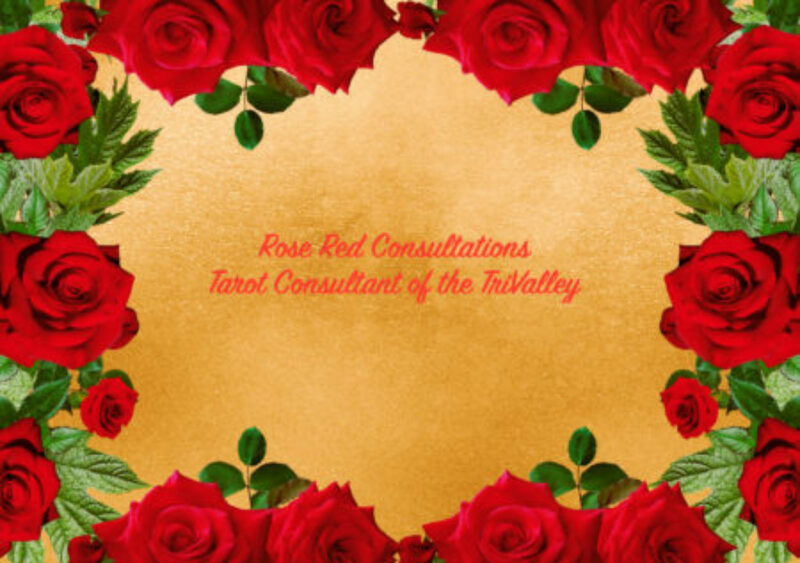 If you book a reading with me, I want to have your name, birthdate and your question or topic for your reading in an email a week prior to your reading. This way I can get a focus on what spread to use to best benefit you as the quarent. I am excited and thrilled to build my practice in this fashion.